Today we can reveal for the first time a 3D Multibeam Sonar image of the Baltic Anomaly. This image was posted on the team’s Facebook page last night and gives us a unique insight into the underwater geography some 80 metres below the surface of the Baltic Sea. 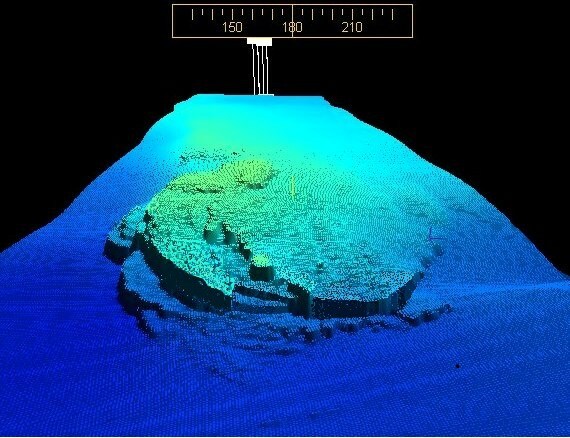 The anomaly as a 3D multibeam sonar image. South is towards the top of the image. Editor's Note: The Green coloured areas are areas of higher elevation and in terms of scale, areas of less than 8 metres will not be accurately defined. “The image is treated so obvious “false” echoes are taken away. But it is impossible to work with the image more than that. It gives us a sence of the main features of the anomaly. You can not look into details because there are no details in this image. Things that might stick up might do so because of the bad resolution, they might not be there at all. 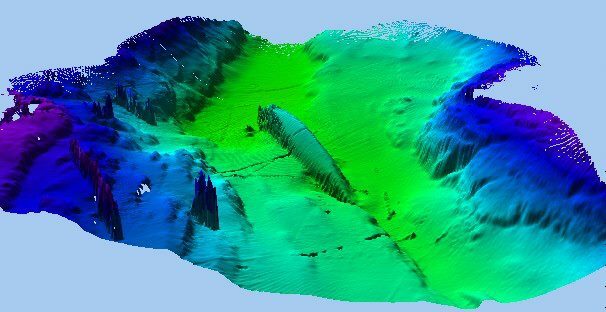 Example of multibeam sonar – Shipwreck in Norway recorded under perfect conditions. Baltic Anomaly Mystery: New Voyage to 2nd Anomaly Baltic Anomaly: Evidence of Ancient Mining Operation?